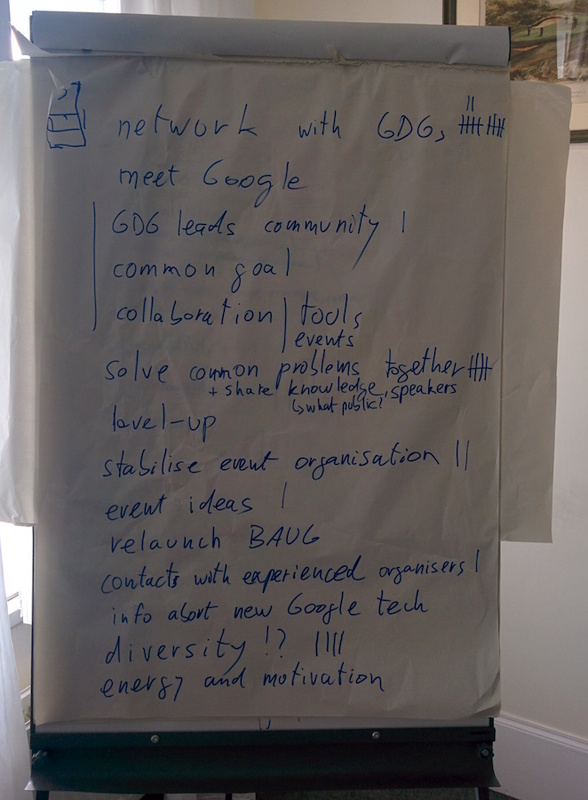 Between September and October of this year, I organised two national community summits, one for Italians Google Developer Group leads, the other for French. 70 people in total, a weekend each, lot of fun! After explained the reason why I worked on that, my stream of consciousness continues along a temporal line: the before the summit, the during, discussed in this post, and the after, subjects for future post. As described previously, the summit agenda is co-decided together with the participants, and it can be very fluid and dynamic. But there are some activities I always run, because I consider them structural to a good summit. 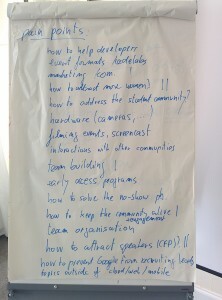 The opening activity defines a list of common summit objectives, from participants point of view. We need concrete metrics to measure summit success, and the number of achieved goals from that list by the end of the event is a good one. There are plenty of techniques to create that list, but I personally prefer to ask participants to write down on sticky notes the two most important objectives they want to achieve at the summit. After 5 minutes, I start asking to a person to read her first goal and then, back to all the participants, how many have reported a similar goal. Then, we may slightly adjust the original goal to include also the others, copy it into a whiteboard and add how many people have it in common. Finally, all the sticky notes covered by that goal are discarded. And I repeat, until all sticky notes are finished. When discussing a goal, I try to be specific and precise, because it’s easy to move to very generic objectives hard to measure, like “Getting ideas to improve the quality of my community”. Improvements regarding what aspect of your community? Number or participants? Core organisers? Speakers? Sponsorships? Writing down on two sticky notes, instead of freely asking what those goals are, allows to focus on the really important ones. Otherwise, without selecting them first, it would be easy to say multiple times “Oh yes, true, this point is important also for me”, losing the importance dimension. In addition, the list provides insights on potential topics to discuss in the months after the summit, during the follow-up community management training sessions. Among the many techniques to create this map, I proceed like previous activity: one sticky note each attendee where write down the most important need their community has. Similar discussion to find if others have same need, copy it to the whiteboard, together with the number of sharers. But now, before moving to the next one, I ask how many people have already solved what we just highlighted on the board. If someone raises her hand, I say to the people with the need: “Memorize her face, now you know near to who you have to sit down during the lunch”. Then the summit continues, with its specific agenda. One attention I have is to leave different free moments for destructured chats. Moments with nothing to do, but I don’t give the impression they are empty slots of time: I put them in the agenda, using terms as “Free chats”, or “Coffee machine chat moment”, so attendees know what they are supposed to do. Inevitably, the summit also arrives near to its end, and I reserve the last two hours for three activities: a free Q&A session, a quick summit retrospective and the group photo. Despite the unplanned free chat moments, I’ve seen that some questions are common to lot of people, so discuss them all together can save some time and allows to stay all aligned, and I reserve 45 to 60 minutes for a firechat with me and the other Googlers. In the past, we have gone from the kind of support Google can offer for their activities, to national events we can plan together, from details on some Google-wide initiatives, to complaints from managers. We’ve also discussed the evolution of a national community identity, a strategy to record, edit and publish sessions presented during the community events, if and how to do social media involving all the communities and much, much more. In order to verify summit success, I reserve another 45 to 60 minutes to a quick retrospective. We start from the first whiteboard created at the beginning, asking, for each objective, how many people feel it has been achieved. 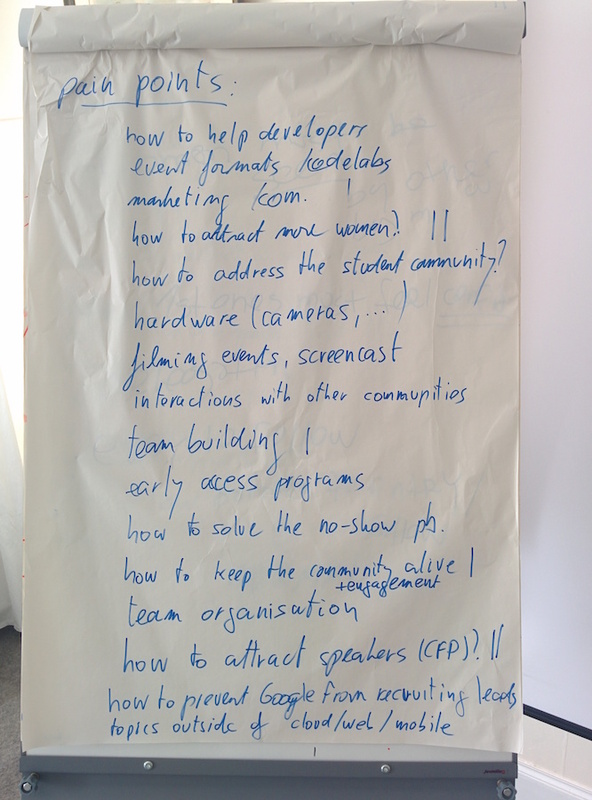 Then, some simple math: if 7 people participated to the summit to figure out the next step of their community in term of event format, and 5 of them have been able to find good ideas, we had a good success on this goal. Clearly, only people who proposed an objective can decide if it has been reached or not. The sum of the success scores for each point defines how the summit has met the expectation of the attendees, if the time they bet on the event was well spent or not. Similar approach, but this time for needs partially or totally solved. Then we decide if there are Action Items we need to carry on after the summit. Writing them down and assigning responsibilities and deadlines for them is crucial, because the day after the summit is… A totally different day and it’s easy to forget everything! Last part of the retrospective is dedicated to fill a form I prepared with evaluations for every single activities and sessions proposed during the summit, in a scale from 1 to 5, plus some bonus questions like the global usefulness of the summit, the best thing, the one to improve for the next time etc. Ten minutes are reserved for this activity, because… Again, tomorrow is Monday, and we have already forgotten everything!